The enchilada is an ancient dish that has gone through many changes since its pre-Hispanic origins. The now vastly transformed enchilada is a popular comfort food enjoyed throughout the world. One key difference is the amount of salsa we use. 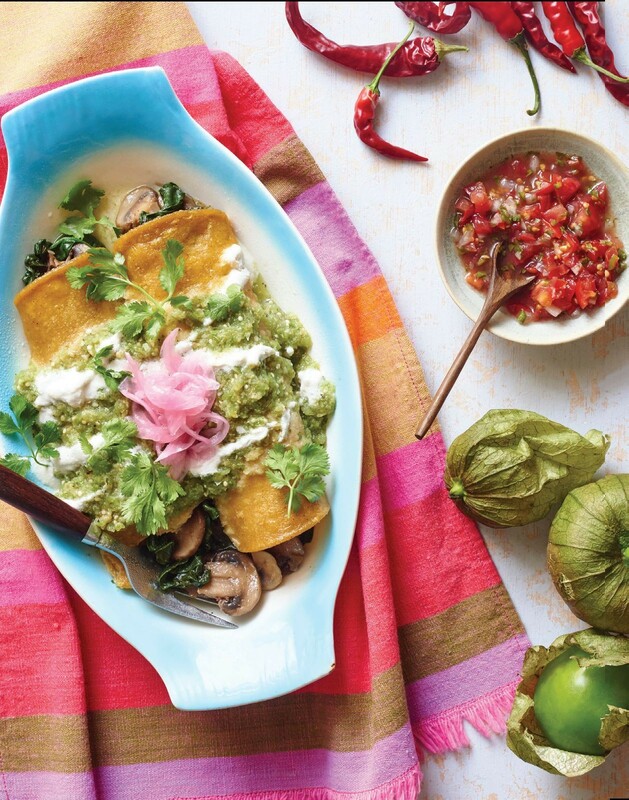 In ancient times, filled tortilla flutes were dipped in chile sauce; now they’re drenched in sauce, this modern take on the Aztec classic, featuring Roasted Tomatillo Salsa, fresh spinach, white button mushrooms, and Cashew Crema Mexicana, is the perfect addition to any springtime party. First things first- hello! You may have realised I’m not the usual name or face that occupies this page, but rest assured you are in the hands of an extremely passionate plant-based foodie. 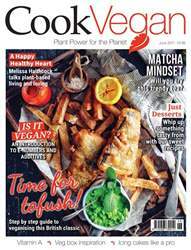 I’m super excited to be joining Cook Vegan as Editor. After crossing paths with the title at WH Smiths whilst being stranded at a cold and snowy London Liverpool Street Station one January evening earlier this year- I instantly admired how the publication is simply dedicated to GOOD vegan food. And as I join the Cook Vegan team, this is something I’m driven to continue doing for you all. With so many amazing vegan chefs, bloggers, street food, recipes, health foods, cookbooks and communities out there- I can’t wait to bring you the best new (and old) ways to fuel your body, mind and soul with plant-based foods. With this in mind, there is something undeniably therapeutic about creating your own delicious food. For this issue, we've put together some features that we think will inspire you in the kitchen. For me, growing up in a small seaside town meant the dawn of British summertime often involved many breezy brisk beachside walks– salty air, gentle lapping waves, and of course fish and chips. Being vegan doesn’t mean missing out on this traditional dish – as our delicious cover photo shows! Turn to our Essential Guide and recipe to fully discover how to create this classic yourself. Whatever type of food you fancy cooking, we have you covered, from lighter bites through to family meals and delicious drinks. Fancy something tasty for after your meal? Our Cook Like a Pro feature teaches you how to veganise icing so you can decorate your cakes like a baker. If you are looking for inspiration, just turn to our interview with blogger, writer, recipe developer and food stylist Melissa Haithcock. She's extremely passionate about nutritious plant-based food and has some delicious recipes for you.